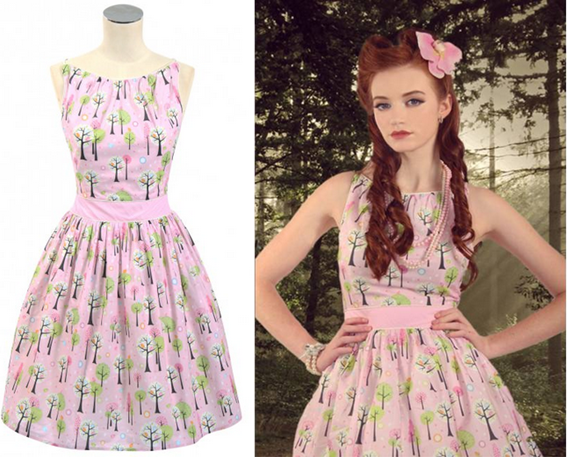 This dress is part of the new Enchanted Forest Collection at Kitten D’Amour. It is perfect, beautiful and totally my style; it’s one of the most gorgeous pieces I have seen in a very long time. There aren’t many novelty prints in local stores around here; I usually have to source fun prints online from the other side of the world. This is extremely unique and I love how it has a soft pink colour scheme. I really need to add this to my collection of dresses. I’ve had my eye on this skirt for awhile now and was so tempted by it that I almost bought it at full price. However, I did the right thing and waited until it came on sale and now it’s at 50% off. I’m sure it’s obvious that my favourite prints are florals and polka dots but I rarely see them together so this is a lovely unique design. I also love the bright colours. The silhouette is different from other skirts in my wardrobe. It’s a pencil skirt at the top which graduates to a fishtail. The material is also unique; it almost feels like a swimsuit. I love so many shoes from ASOS at the moment so I made a small collection here of my favourites. ASOS brand have so many amazing and beautiful shoes. The burgundy velvet pair are the best and I wish they hadn’t sold out in my size; I will have to keep an eye out in case they are restocked. I also love the brand Faith Shoes which is sold on ASOS. I had never heard of the brand until my sister bought me a pair of rainbow glitter heels for Christmas. Now I am drawn to the many fabulous glitter shoes. I actually have this dress in pale blue (and it also came in pale pink) which I purchased from Kitten D’Amour a number of months ago. It was very popular as it sold out quickly and I went to quite an effort to track down the last one in my size. I was first drawn to this piece because it reminded me of Princess Elsa from Frozen. I absolutely love her and anything which reminds me of her is the best. 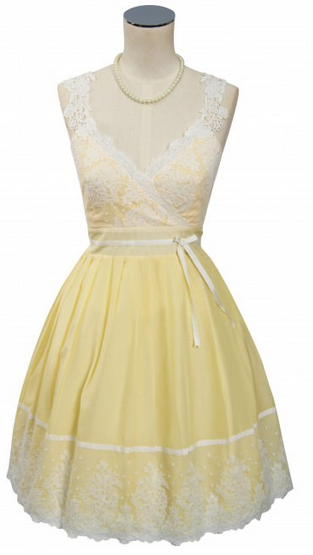 It appears as though Kitten D’Amour has re-released the dress in different shades. Since I am super obsessed with yellow in recent times. If it wasn’t for the Frozen inspiration, I would probably prefer the lemon version. I can’t get it out of my mind! Ever since I borrowed a real Chanel Bag (here) I have been extra obsessed with quilted bags; they are very pretty and classy (even when not genuine Chanel). I was drawn to these bags because of the size. I don’t have many practical sized bags and I’m very much in need of them especially for days at work. The pink version is obviously in alignment with my style. I like the contrast with the black and white version, coupled with the bow (makes me want to make some DIY bows for my existing bags). yes, of course I go to follow each other, beginning … I have just become a follower of your blog 735. Those dresses make me think of spring… so lovely! Love every single item you picked!! The bags are my favorite, as well as the Kitten d'Amour dresses. Just lovely…I love the polka dot/floral skirt, it just so pretty!!! I just adore that first dress! 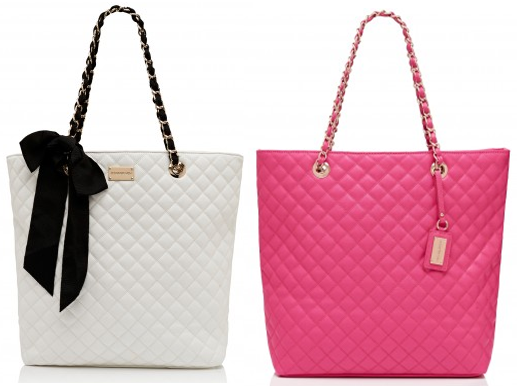 The quilted bags are super sweet too! I can see why you need that dress! 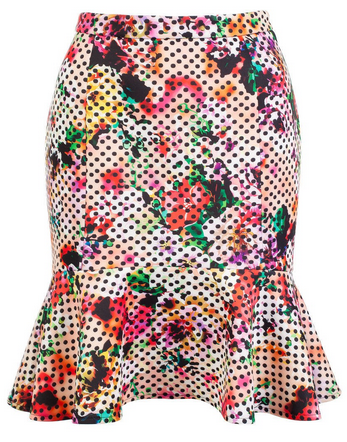 The print is so gorgeous and would be so perfect for those hot summer days! I also adore that skirt! The cute flirty hem is perfect! White and black bag is just amazing! Thanks for sharing! Great selection. The shoes are amazing. I'd love to follow each other. actually I'm folowing you right now! All of these are beyond cute! Great picks. ALL of them!! I am glad you waited for the sale to get the skirt. I will check out those sites, I really love what you chose to feature, and buy!